HCFoo's Tennis Blog – Tennis Celebrity Photos, News, Gossip and More! 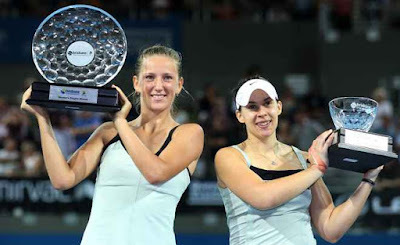 : Victoria Azarenka wins title in Brisbane; yikes, the ponytail! 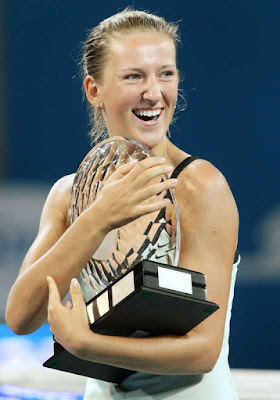 Victoria Azarenka wins title in Brisbane; yikes, the ponytail! Seriously, Victoria Azarenka's phython-sized braided ponytail is very distracting. The other braided ponytail that I dislike is Mary Pierce's. Put the hairy issue aside, the good news is, Azarenka earned her first WTA title, defeating Marion Bartoli in the final at the Brisbane International. Belarus’ Azarenka, the no. 2 seed, cruised to a 6-3, 6-1 triumph over the third-seeded Frenchwoman in the second career meeting between the pair. “Everybody says the third time’s the charm but for me it is the fifth one - I’m just glad I got it,” Azarenka said. Azarenka defeated Bartoli in just 71 minutes.